The 2019 MAC Awards will take place on Tuesday, March 26, 2019 at 7pm at Sony Hall. Read the full list of 2019 MAC Award Nominees at macnyc.com and purchase tickets. 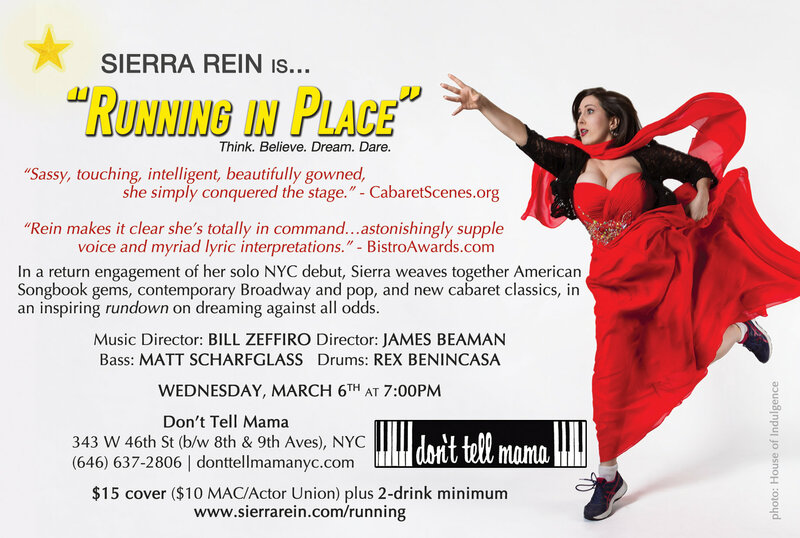 In her highly acclaimed NYC solo debut, Sierra Rein weaves together American Songbook gems, contemporary Broadway and pop, and new cabaret classics, in an inspiring rundown on dreaming against all odds. Featuring compositions by Kander & Ebb, Frishberg, Blumenkrantz, Sondheim, Goldrich & Heisler, and more. Directed by James Beaman. Music Direction by Bill Zeffiro, Matt Scharfglass on bass and Rex Benincasa on drums. “Rein makes it clear she’s totally in command of where she has long wanted to be…offers a carefully chosen baker’s dozen numbers that are every bit as wide-ranging in content and style as her astonishingly supple voice and myriad lyric interpretations.” Read the review by Robert Windeler of BistroAwards.com. “And oh, does she know how to build a number…transforms from saucy to sizzling…an emotional payoff with the skill and confidence of a Judy Garland or Barbra Streisand.” Read the review by Bart Greenberg of CabaretScenes.org.